Three Dalits were allegedly thrashed by four men for objecting to their casteist slur in a village near Una town in Gujarat’s Gir Somnath district, police said on Friday. Two years ago, four Dalit youths were flogged by upper caste cow vigilantes in broad daylight in Una. One of the accused in the case, Ajit Gohil, who is currently out on bail, has been accused of assaulting 3 Dalit men who objected to casteist slurs. Gohil and three of his friends is said to have attacked three Dalits near Una on Thursday, 8 November. The complaint was filed by one of the victims, Manu Solanki (27), who accused Gohil of being one of the attackers. The Dalits were allegedly thrashed by the four men for objecting to their casteist slur in Nandrakh village near Una in Gir Somnath district, police said on Friday. The incident occurred around 400 km away from Ahmedabad and no arrests have been made so far. According to the report by Quint, the three other accused are Mahendra Gohil, Kishor Gohil, and Aniruddh Gohil, all belonging to an Other Backward Class (OBC) community, the police said. According to the copy of the FIR filed at the Una police station, the incident took place when Manu Solanki and his relative, Bharat Solanki, were returning to Nandrakh on foot. When they entered the village, the four men, who, according to Manu, were drunk, started hurling casteist slurs at them. One of the accused attacked Manu with a knife, which left a wound near his face, the FIR said. The accused also thrashed another relative of Manu’s, Ugabhai Solanki, who had rushed to the spot to save the duo, the FIR stated. “The men were using derogatory language to abuse my brother and our cousin. When my brother protested, they attacked them and injured them grievously.” said, Jitubhai Solanki, Bharat’s Brother. When the injured were being taken to a hospital in an ambulance, the accused tried to block its way using their motorcycles. The three are currently undergoing treatment at a hospital in Junagadh town, police said. 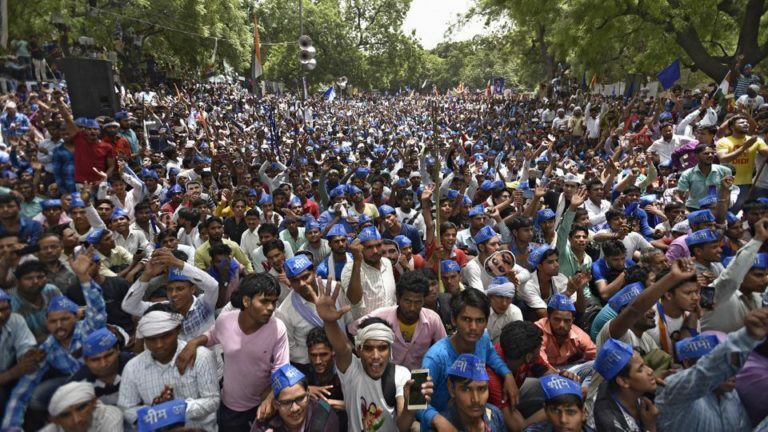 “They were brought to the police station, where they were not put in a cell but instead seen loitering in the police station campus, laughing and speaking on the phone,” said Piyush Sarvaiya, Local Dalit Activist. The four accused have been booked under various sections of the Indian Penal Code and the Scheduled Castes and the Scheduled Tribes (Prevention of Atrocities) Act, the SP added. On 11 July 2016, four Dalit youths were beaten up, allegedly by cow vigilantes, near Mota Samadhiyala village of Junagadh district when they were skinning a dead cow. The attackers had claimed the victims had killed the cow. Later, the accused took them to the nearby Una town and once again thrashed them with sticks and iron rods after tying them to a vehicle. The Dalit men were also paraded half-naked on the road in full view of the public. The flogging had caused nationwide outrage and triggered protests. Be the first to comment on "Dalit men attacked in Gujarat’s Una for objecting to casteist slurs"